Tell us: What was your first mobile phone? From the days of playing snake on your phone, to the mobiles that had a colour screen and an internet browser, we discuss the first phones we had and why they still have a place in our heart. I still miss this phone ☹ Simple and easy to use, I remember having a weird colour and always remember dropping it but it never broke. It's the ultimate brick. I was the lucky owner of a Sony Ericsson Z300, that my friend won from a vending machine for $2 outside a Safeway supermarket in Albury. If only phones were still that cheap! My first mobile phone was a purple Ericsson GF 768. It weighed 135 grams, had no games, monophonic ringtones and a battery standby of 60 hours. Not technically my first phone, but rather my first non-hand me down phone. The all-round slick design combined with the slide out keyboard gave it a modern feel (for the time). It also had MSN messenger built-in as the default messenger. What more could you ask for? What was your first mobile @Davelew @MiCCAS @petergdownload @SillyGogo @Yeldarb @SamSam @Paddylee @10000000000GB @caaf ? Nokia 6110 for me in 1998...gasp! Is only a 2g device, so pretty much not usable in Aus now. Did have snake game that I loved! Also only having to charge it once a week was a benefit. If an original car phone is considered a mobile phone I can go back to 1985 in London. Much excitement when it was installed in my car, I think in those days a Ford Cortina. No idea of the make of phone but it comprised of a large unit in the boot and a fixed handset attached to the dashboard. At that time only worked in London. This progressed to what was referred to as the brick, a large battery with the phone on top which was supposed to be portable but needed a set of wheels to transport around. Things have certainly improved since those days. My first analog phone was err um can’t remember mind what’s sad is I remember setting it up in the van, it was in the early 90’s (hand me down) mind I can tell you that I went Nokia for a decade then iPhone. Yeah I know way to much info, sozz. My first one was an Motorola analogue, can't remember the model number. It was the first one without the classic motorola flip. Came with 2 batteries and desktop charger. Found this picture on google..
As a teenager, it was proudly hang around the belt with a leather clip on case. Here are a few that I still have. Well until the next cleanup. 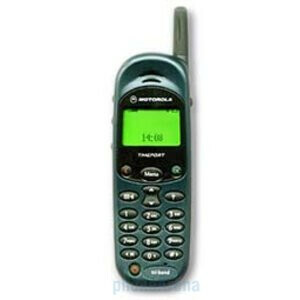 @Paddylee 6110 was my dream phone.. Couldn't afford it, settled for the 5110 and changed to the smaller battery instead. @pwright is pretty old, perhaps he had one of these? Haha, that's quite the collection of antique handsets @SillyGogo. That's the classic Razor on the left? @Dan_C yes it's the razr v3 will bonus mp3 and accessories. Now to really go back can anybody remember the pager. When it goes off trying to find a phone box with change. Then finding it has been vandalised or stinks so much you can't bear to use it. When was the last time anybody has used a public phone? @Paddylee I remember the pager, it was a special things. Works where no mobile phone coverage. Last time is use one was in 2015. Pretty sure it was one of those Nokia 3210 phones. Still remember those hands reaching out to .. reach out? I think I was actually involved in the first CDMA trial where I got a free phone for giving reception feed back. Ah the 9 button SMS days. Still amazes me that even the iPhoneX doesn't have a swipe keyboard today. My first phone was this guy - Nokia 6131! A hand-me-down from my parents. I absolutely love all of these comments. Still have my Samsung Note 1, and Galaxy S 1 (both still work). What, working in the best team ever @AlistarS? Yay for Snake! This monstrosity here was my first mobile phone. Felt so awkward with the case and belt clip that it would swing when it got windy. While I never liked it, it was a cheaper phone I could afford when I first started working. NEC P100 and also carried a pager for 5 years for work. It coincided with me getting my first car. Got it for emergencies at first as I was driving from Cambridge to London daily, sometimes in the middle of nowhere. Back then, 30 minutes a month on the plan from Cellnet was a luxury! Nowadays Cambridge to London is one long traffic jam. I'd be surprised when you had this phone if you got reception for more than half the journey. I think 1992 or 1993 a Mitsubishi Diagem, the first non "Brick" mobile avalable in Australia. It also had a pretty fancy hands free car kit for the time. With all this nostalgia is it time for Optus to have a new section for Retro phones. @Dan_C could have a promotion to manage Optus Retro. Hopefully he would then ditch his iPhone. I don't know how great the reception worked when I had an accident one winter morning. @Pommster oh the joys of working in London. I can remember leaving Rotherhithe on a Friday lunchtime to go home to Gloucestershire and sitting in a traffic jam on the Embankment for 2 hours. Someone a 120km journey would take 5 hrs. Well technically speaking I had a mobile phone receiver long before I had a mobile phone. The cost of phone calls put me off and the good old UHF repeaters system worked well with my locally made Phillips UHF radios.